During the past few decades, partially thanks to Banham, the popular understanding of LA has started catching up to the city itself. To many who have spent little time in LA or have viewed it mainly through the lens of pop culture, it’s still a suburban metropolis. But New York, Chicago, Boston, and San Francisco are also mostly suburban, aside from relatively small central areas where most of the conventional wisdom is generated. More people depend on cars in Los Angeles than in the aforementioned cities, and this produces a less dense built environment, but do those characteristics alone disqualify LA as an “urban” place? Plenty of well-informed people seem to think so. Visiting Los Angeles last weekend (and many times before that) has reaffirmed my belief that it is one of the most urban cities in the world by almost any definition of the word. Among the most striking features of LA, contrary to its reputation, is its incredible density. 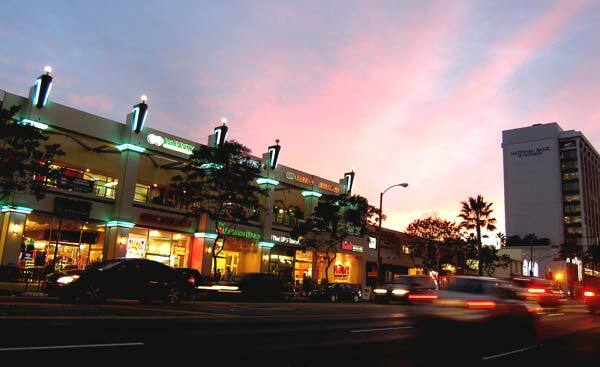 Throughout the city, from Koreatown to the Valley, Los Angeles is packed tightly with human activity. Signs announcing 20 different stores accompany two-story strip malls; apartment complexes overlook the back edges of gas stations; and cars wring every square inch out of parking lots that are frequently too small. Instead of a suburban sprawlscape, Los Angeles is better understood as the highest possible density that is traversed primarily by automobile. Unlike New York’s three-dimensional congestion, LA’s is mostly confined to a single plane, but it fills those two dimensions almost as effectively. The classical definition of “city” is a hobgoblin that still haunts the urban discourse: a recognizable downtown (which LA has, in fact) with a transit system connecting the periphery to the center (which LA also has). Those forces ceased to drive urban development more than a century ago, yet we still understand cities to be the residue of that obsolete growth model. LA represents a mode of development that emerged in the twentieth century, and while it may be doomed from an environmental and social perspective, its scale is more human than the modernist wasteland of downtown Newark (another “city” in the classical sense). We need to adjust our understanding of what makes a city a city, because at present there is little being built in the world that matches Woody Allen’s or Dorothy Parker’s definitions. They also have a one of the broadest amounts of stand limitations on the internet with something budgeted to accommodate every ones level and normal of enjoy. enormous article to improve my experience.